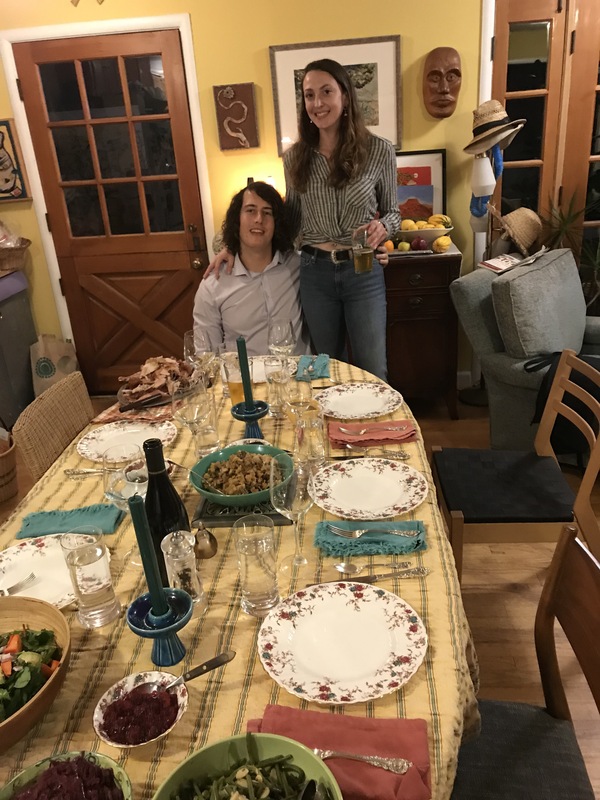 After going to Nevada City to join Rick’s daughter and boyfriend and his family, we had Thanksgiving 2 at our house with my son Alex, his girlfriend Shannon, and my son-in-law’s parents. (My son-in-law is in the Navy, stationed in Japan, with my daughter and our two grandkids). We had a lot of fun and one of the highlights was making authentic German red cabbage. Actually, it was my son’s request–but as I was limited in time and space, I asked him to bring the chopped cabbage. He did and I was happy to make the recipe. It’s very easy. The trick for the best results is to use no water, just red wine and red vinegar for the liquid. Also it does take a few hours to cook to the right tenderness and flavor, but is just as good if made in advance and reheated. In fact, that’s my favorite method. 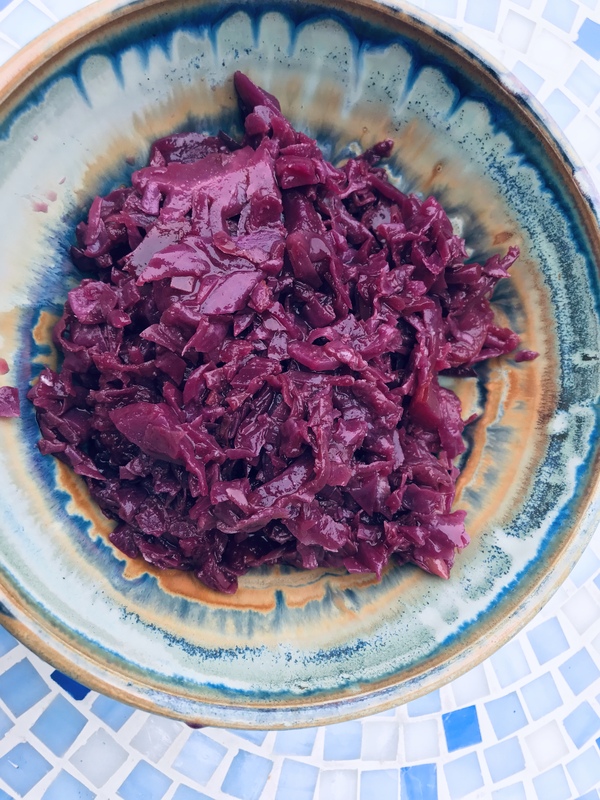 When I have had red cabbage at most German-type restaurants I find it too sweet. The way my Grandma made it it is on the tangy side, with just a hint of sweetness, from the apples and sugar, (in this case, Xylitol. ( If you’ve been following my blog, you know that’s my preferred sweetener for low carb sweetening.) It’s such a great way to enjoy a dish that’s not often served, that is low carb, low calorie, and is full of flavor, fiber, and nutrition *. 3. 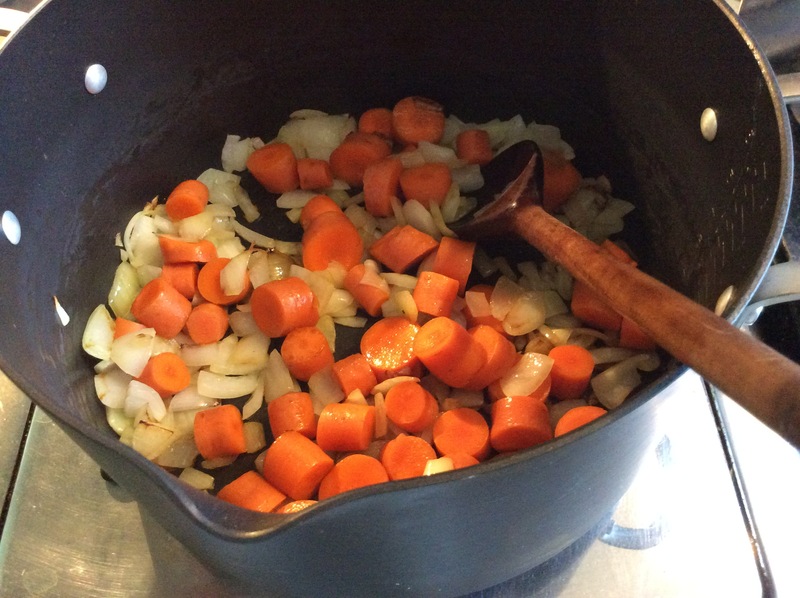 Add all ingredients into a Dutch oven or 4 qt. pot. If you’re lucky enough to have a bounty of tomatoes (my favorite!) and zucchinis, this is a tasty and very easy side dish. I’m originally from Ohio, and we had great weather for growing tomatoes. Come September, the crop was often still abundant, and we were finally ready to do something besides eat them raw or on BLT’s. After making spaghetti sauce, and perhaps canning, this dish is one of my favorites to serve along side roast chicken and grilled fish. 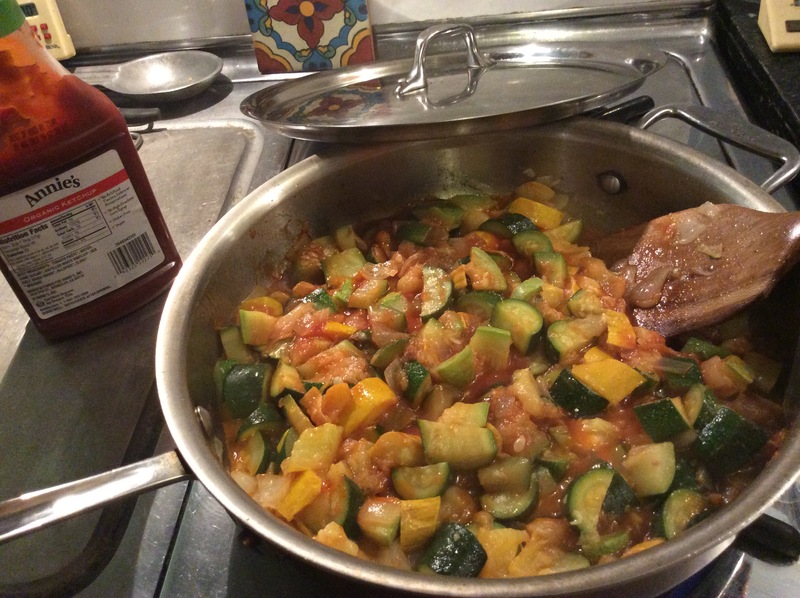 Basically it’s three main ingredients; chopped onions, zucchini and tomatoes. The cooking is simple–sautéing in stages; you can put this together and serve in less than an hour. It can be cooked in advance, refrigerated and then reheated. (I suggest reheating in a pan–not microwaved.) What’s especially good about this dish is that it combines these wonderful summer vegetables and keeps their fresh tasting integrity, while the combination adds a lot of flavor. 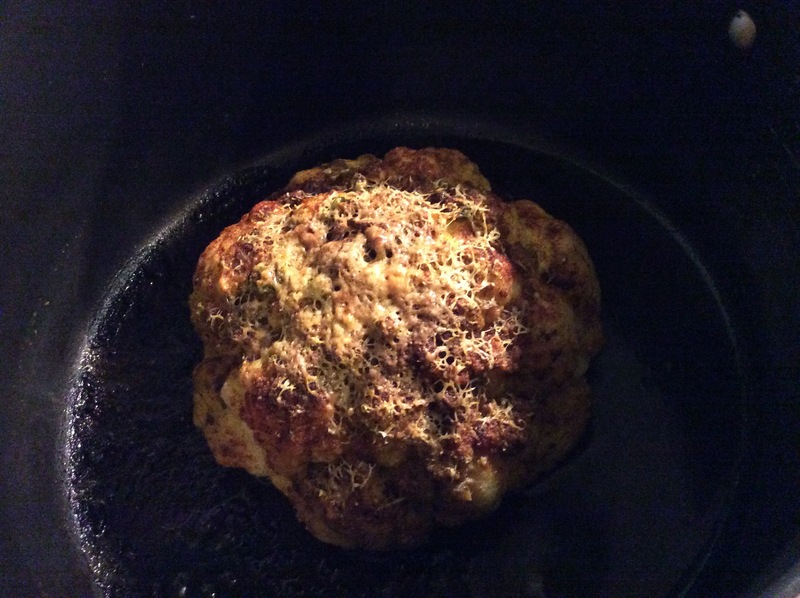 Easy, low carb and very delicious! 1. 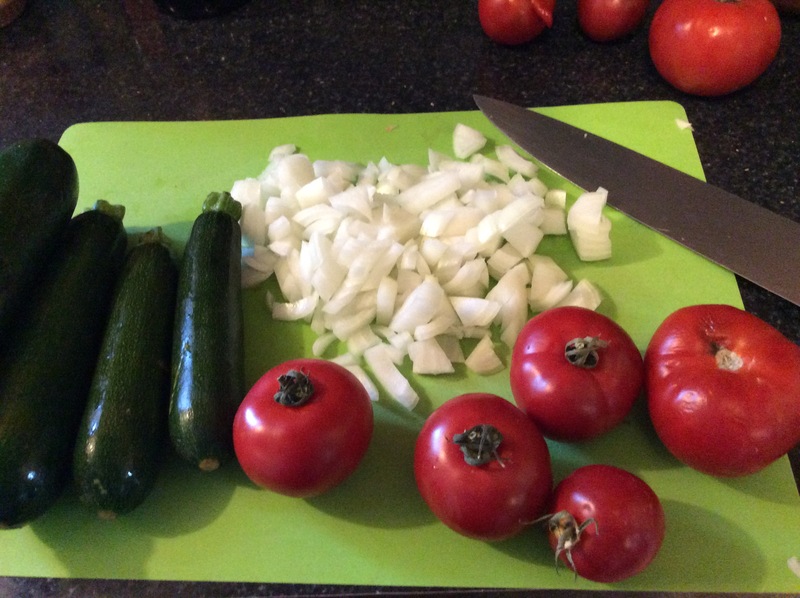 Chop onions, dice zucchini to approx. 1/2″ pieces, cut tomatoes into quarters, or smaller, depending on the tomato size..
3. Add the onions and sauce (no cover) for approx 4-5 min. until slightly brown and soft; of course, stirring as they cook. 4. 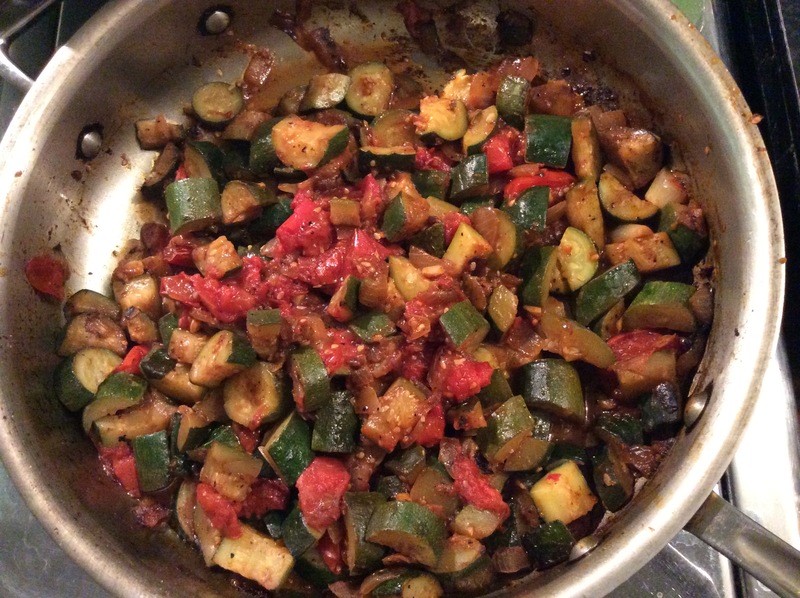 Add zucchini–sauté another 5-6 minutes, until softened (if you like them slightly crunchy, taste for firmness to your taste). 5. Add tomatoes and sauté another 2-4 minutes, until they are softened and skins separate. 6. Mix all together with herbs and seasonings to your taste, and a few drops of lime of lemon if you like. Very simple, very fresh tasting–your family and guests will thank you! I posted this last year but have had an abundance of squashes, so thought it is a good idea to post again. We’re still enjoying the last of the summer. (Actually, September/October is our real summer- June, July and August are usually foggy and cool here by the ocean); except this summer which was unusually warm— say global warming anyone? 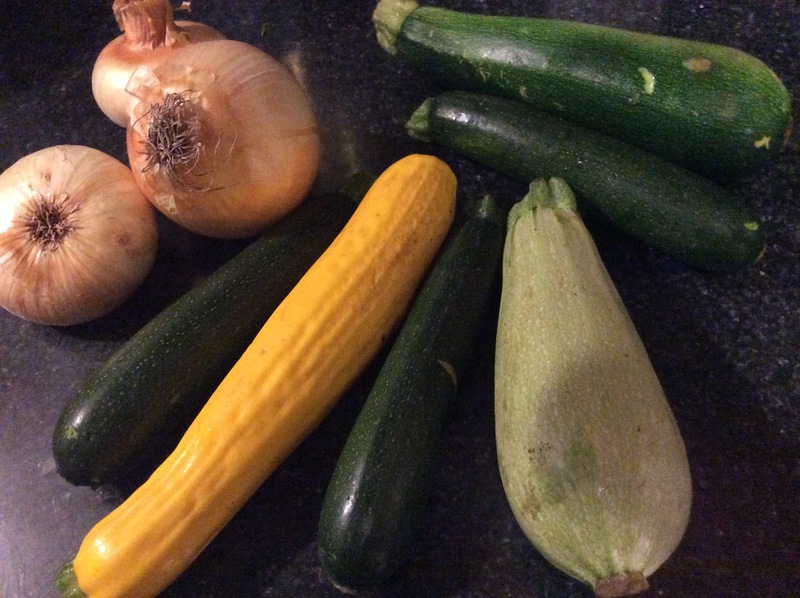 Which brings me to this recipe for your remaining summer zucchini/squash harvest – plus what’s still available at farmer’ markets. You can use any type of soft skinned winter squashes just as well. This family favorite is a great side dish for roast chicken, broiled fish or almost anything you serve. 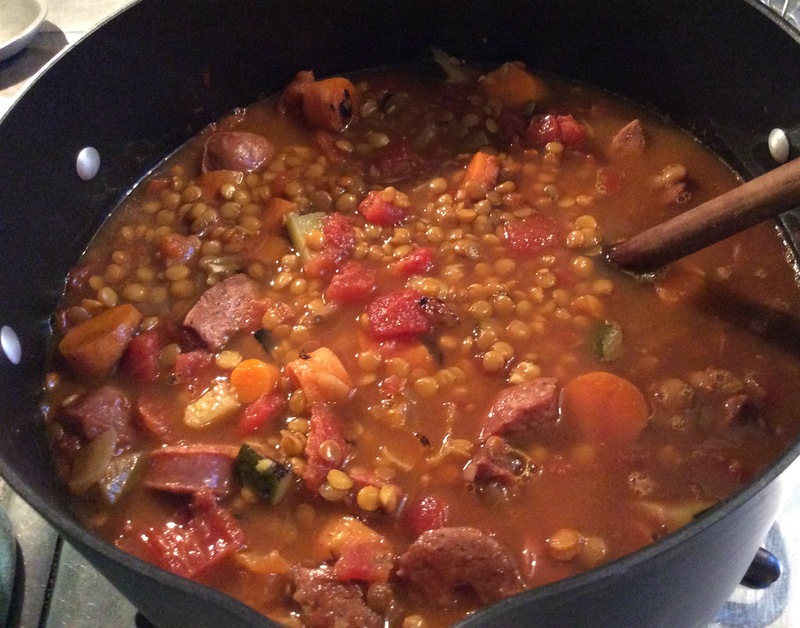 I first enjoyed this recipe when I was visiting my mom’s cousin Erica in LA in the eighties. My mom and her cousins Hans and Erica were born in Germany- escaped here during the war. Erica was an excellent cook. This dish surprised me as I had no idea that the “sauce” was nothing but ketchup, and that ketchup is a mainstay of German cooking! This is a very easy to make dish with a rich, satisfying taste. It always comes out delicious. 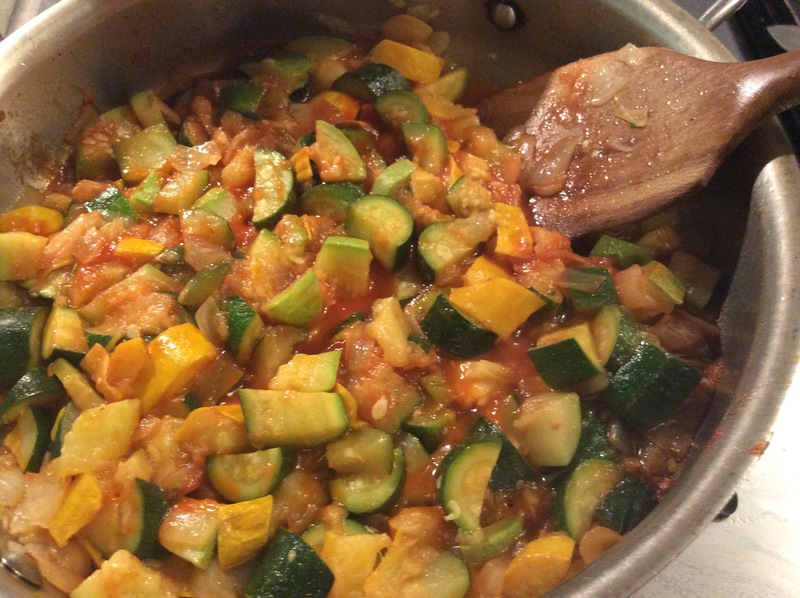 You can use any combination of squash and onions you like. I make it for company and let them guess what is in the sauce- so far no one has figured it out! But now you know! That’s it! I’m sure you’ll be surprised at how rich tasting this is! Thanks Erica! Rick and I went to Birba, an excellent restaurant in Palm Springs. It’s a popular place with all outside tables and beautiful lighting, especially enjoyable on a warm night. 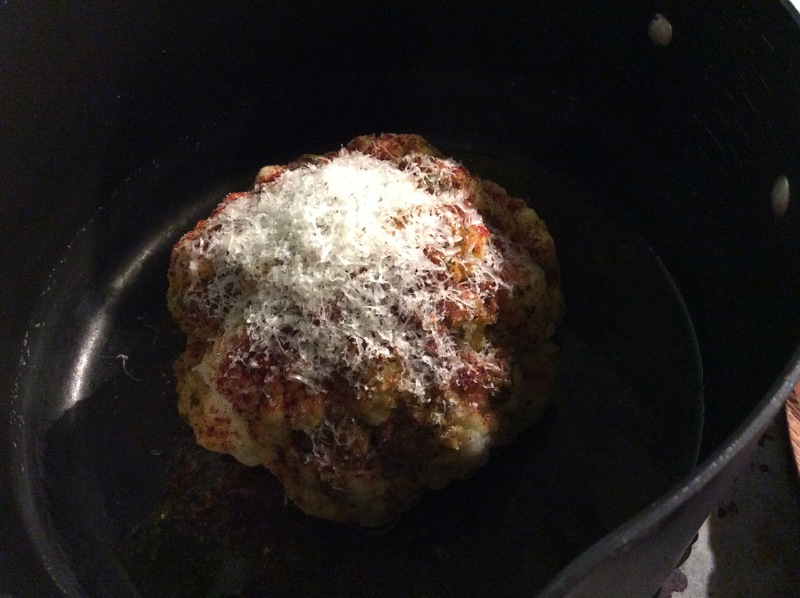 We loved all the food, but were especially blown away by the cauliflower. It was served whole; twice cooked; boiled first and then baked with cheese. It’s actually quite simple to make and is a wow dish to serve your friends and family as a side dish; (true confession–we usually make one and eat it all ourselves). I’ve tried to reproduce the dish we had at Birba, but have made my own variation, with more of an Indian spice flavor. You can use other spice combinations that you like, such as Italian seasoning, dill or basil. The main thing is the first steam or boil the vegetable whole, then add seasoning in an olive oil base, grate cheese on top and bake. Looks very elegant and tastes delicious! 1. 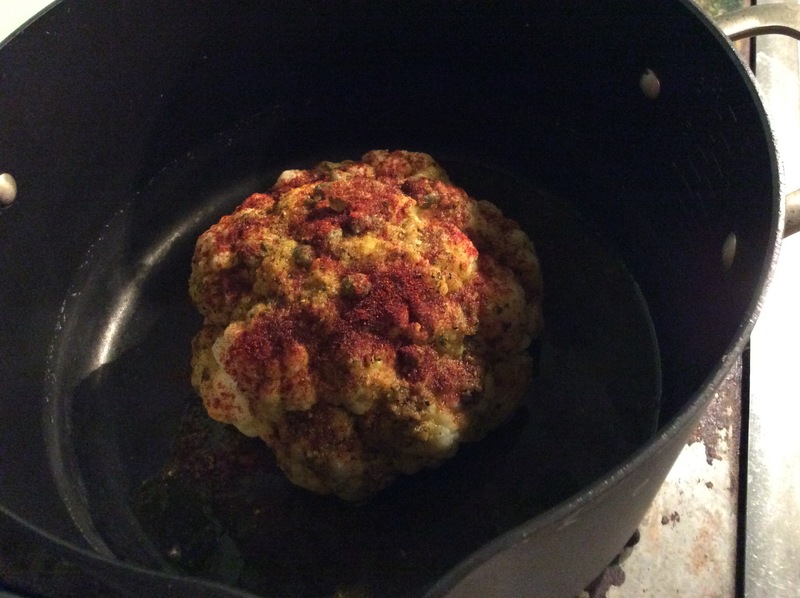 Wash and core cauliflower, but leave whole. 3. Whisk all spice ingredients and capers in olive oil, except for Smoked Paprika. 5. Sprinkle paprika, and grate cheese on top. 6. Bake for 20-30 minutes, until brown and cheese is melted. Serve as a side dish; and, as we usually have, a crisp green salad with a tart, lemony vinaigrette–see previous Salad posts for the vinaigrette recipe: Persimmon and Endive salad; (can be made with pears, orange/tangerine pieces or even strawberries, depending on the season). (or two). With ketchup of course! You can make this Meatloaf with ground turkey or a ground beef/pork mixture depending on your preferences. It’s delicious either way. I confess we often watch TV while we eat, and meatloaf sandwiches are just great to munch while watching British mysteries! Of course, Rick being the disciplined guy that he is takes a walk every evening after dinner to lower his blood sugar; I join him often; see the Journey for more Type2 diabetes lifestyle tips. 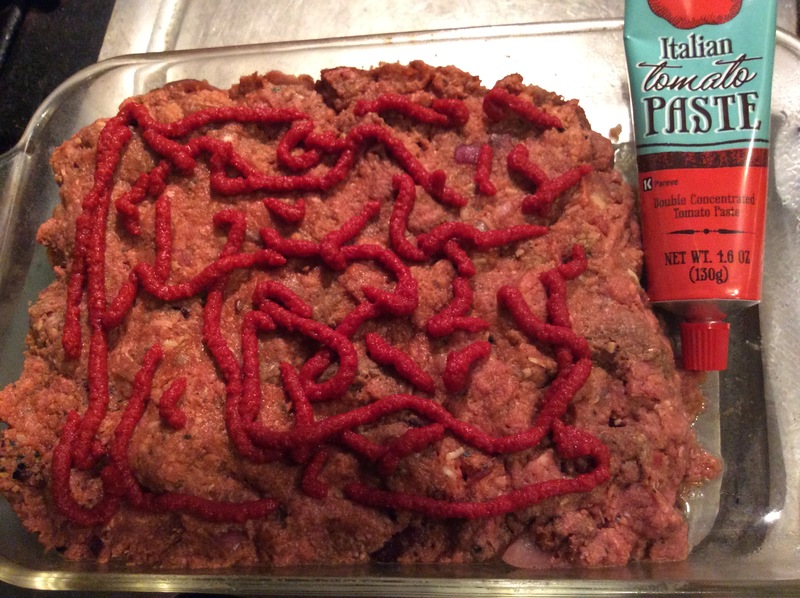 I’ve recently discovered something that makes my favorite Meatloaf topping very special and easy. It’s Italian tomato paste in a tube. You just squeeze out what you want – I like to make squiggles that melt and spread while cooking. Instead of opening a can and only using a small amount and the remainder then usually sits in my fridge and I forget about- yes, it goes bad and I throw out once I notice it! 1. Mix turkey or meat with chopped onions, beaten egg and spices- I use my hands. 4. Mix tomato sauce with bread in a bowl- mash with fork til completely mixed and bread is soft. 5. Combine all in a bowl- best using hands again. 6. Put meatloaf mixture in a loaf pan prepped with an oil spray; Pam or olive oil spray works fine. 9. Bake at 375 for 40 minutes. Turn oven off and let sit inside for another 10-15 minutes. 10. Serve with your favorite whole grains and a great salad – this is a delicious one with goat cheese, persimmons and greens. It’s starting to be fall in Santa Cruz – there’s a chill in the air, although we’re still enjoying the last of Indian summer. (Actually, September/October is our real summer- June, July and August are usually foggy and cool here by the ocean); except this summer which was unusually warm— say global warming anyone?